The Full Machine Room (FMR) Service Plan enables industrial companies to streamline their maintenance processes by working with a single service provider and local point of contact. 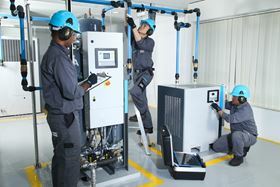 Compressor and vacuum pump manufacturer, Atlas Copco, has introduced its Full Machine Room (FMR) Service Plan, which is designed to maintain all types and makes of rotating equipment used in a production environment. Atlas Copco’s Compressor Technique Service division is rolling out the FMR Service Plan nationwide following a successful 12-month trial with a leading plastics packaging producer in the UK. The company says the new service enables industrial companies to streamline their maintenance processes by working with a single service provider and local point of contact. The FMR Service Plan, which is operated by a local member of Atlas Copco’s nationwide network of service engineers, can be tailored to cover the maintenance of all the rotating equipment in a plant’s utility room. This includes water pumps, refrigeration units, vacuum pumps, air compressors and blowers. Within the terms of the FMR Service Plan, Atlas Copco commits to take complete care of a specified equipment inventory with on-time maintenance carried out by experienced service engineers. Pro-active upgrades, driveline overhauls and the supply of genuine OEM parts are all essential components of the Plan. Atlas Copco has launched a DZM multiple dry claw vacuum pump system.